Mass Mobilization to Stop Drone Wars! Join us March 4-6, 2015 at Creech Air Force Base, Indian Springs, Nevada, for a national mobilization of nonviolent resistance to shut down killer drone operations in Afghanistan, Pakistan,Yemen, Somalia, and everywhere. 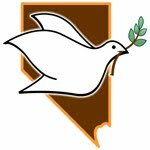 Sponsored by CODEPINK: Women for Peace, Nevada Desert Experience , Veterans For Peace, Women’s International League for Peace and Freedom, and Voices for Creative Nonviolence. CODEPINK will also hold vigils daily on March 2nd and 3rd, prior to the official beginning of this Creech Convergence For Peace, and welcomes everyone to join them. In 2005, Creech Air Force Base secretly became the first U.S. base in the country to carry out illegal, remotely controlled assassinations using the MQ-1 Predator drones, and in 2006, the more advanced Reaper drones were added to its arsenal. Creech drone personnel sit behind computers in the desert north of Las Vegas and kill “suspects” thousands of miles away. Recent independent research indicates that the identity of only one out of 28 victims of U.S. drone strikes is known beforehand. Though officials deny it, the majority of those killed by drones are civilians. In 2014, it was leaked that the CIA’s criminal drone assassination program, officially a separate operation from the Air Force’s, has been piloted all along by Creech’s super-secret Squadron 17. Since 2009 dozens of activists have been arrested for allegedly trespassing at Creech, in attempts to stop the indiscriminate killing and burning of innocent people by drones. In a time of burning children, the “no trespass” signs attached to the fences that protect the crimes perpetrated with drones are not legitimate, and they do not command our obedience. After all, it is the U.S. military that is guilty of lethal trespassing. The US drone program is rapidly proliferating as air bases are being converted to drone bases across the U.S. and abroad, but Creech remains the primary air base in U.S. state-sponsored global terrorism. Creech is where the killer drone program started–it is where we shall end it. We must put an end to this desecration of our Mother Earth and all creatures who inhabit it. We must put an end to the dehumanization of lives from Ferguson to Palestine to Pakistan. We must close all foreign U.S. military bases. Money for human needs. We must put an end to drone warfare, drone surveillance, and global militarization. Sign up on facebook https://www.facebook.com/events/1525740921010540 and invite friends! Follow their special blog Shut Down Creech!